BEFORE WE GO Warms the New York Heart on DVD! 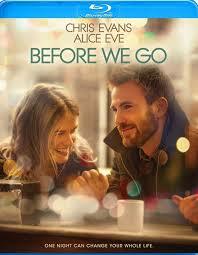 This Tuesday from actor/director Chris Evans, RADiUS and Anchor Bay Entertainment comes a night of two strangers in BEFORE WE GO. Nick Vaughan (Chris Evans) is spending his evening playing the trumpet at Grand Central Station in New York for a few dollars. Getting ready to pack up for the night Brooke Dalton (Alice Eve) whizzes past him in a rush to make her train dropping her cell phone. Backtracking through the station, Nick sees that Brooke is distracted as well as upset. He learns her purse has been stolen; she has no money and needs to get home. Being a gentleman, Nick offers to help her backtrack and find her purse. With that an evening between two strangers becomes a journey through the streets of New York as Nick shares his lost love and Brooke admits to mistakes in her marriage. Both admitting their fears and although uncomfortable at first, what they find is a sympathetic ear and a new perspective. Because sometimes trusting a stranger can be the first step to letting go! This is Evans’ first time in the director chair and I must say he knew exactly what he wanted for this story to be told. First of all, every gal on the planet will fall in love with this character. The character of Nick runs every gambit of emotion from fear, to obsession, love, disappointment and more. He questions everything about himself yet the vulnerability we are privy to see allows the viewer to feel as if we are in the room while he speaks. Evans portrays Nick with such longing, not just for love, or music, but for a connection he hasn’t had because of the obsession with old flame Hannah. I just enjoyed this character so much. Eve as Brooke is a ball of confusion, anger and sadness and when cornered can be verbally cutting. Getting the stolen Prada is the least of her worries as the story unfolds slowly getting to the real story behind why her nerves on edge. It is a difficult thing when love and anger share the same seat. Eve takes the character and twists her insides out as Brooke jumps from what her heart wants and what her head says. Other cast include: Emma Fitzpatrick as Hannah, John Cullum as Harry, Mark Kassen as Danny, Daniel Spink as Tyler and Elijah Moreland as Cole. RADiUS brings high quality film and specialty entertainment to a larger audience than ever before. Such films as BACHELORETTE, ONLY GOD FORGIVES, CUTIE AND THE BOXER as well as my personal favorite SNOWPIERCER are available on their multi-platform. Anchor Bay Entertainment is celebrating its 20th anniversary! Releasing in theatres and home entertainment the company has brought and continues to bring quality films such as STARZ original series, children’s entertainment, sports and specialty films on Bluray and DVD formats. TUBS OF POPCORN: I give BEFORE WE GO three and a half tubs of popcorn out of five. This film is so beautifully put on Bluray with every nuance captured from the lights on the streets, to buildings, to even the views outside the hotel window – everything is part of the story. That’s actually important when two actors are carrying the weight of a film and mesh with the surroundings. I loved it. Both Evans and Eve bring so much to their characters and go full force with the entire human ladder of emotions. Both Nick and Brooke are puzzles of emotions and stories and in this film it seemed only these two people could save one another from the craziness that is their life. There wasn’t a moment where I thought ‘this isn’t even possible’ – but instead I thought ‘oh wow, yep, that’s what it feels like [love, hurt, both]’ and said it several times over. The Bluray and DVD include A Conversation with Director Chris Evans which is a feature I highly recommend watching. In the end – one night can change your hole life!